289 13th Street (above, center) is a new building with a retro facade. It fits into the streetscape pretty well. This one's taken its time to reach completion - and it's racked up a hefty number of violations (including stop orders) over the past eight years, Issues include inadequate plans, working without permits & dangerous excavation work. Adjoining property has been damaged. There are still nine open violations on file. Unit 1R is another of those condo duplexes with below grade level space. With a cellar. 1R has a backyard (a plus) but only one bathroom (a distinct negative for a new condo of this type). It's "exceptional," with two "large sunny bedrooms" (105 & 142 sf), and "sunny rec room." The lower level is around 500 sf, and the main floor around 900 sf. No exact room measurements given. More new windows & shutters on 10th Street, but by late yesterday morning the winds of change had not yet drifted up as far as the (former) VFW Post 9485. A couple of hours later though, it looked like it was time for action..
Will party room rentals be part of the MTA retail plan? I have my doubts. I finally got round to seeing A Most Violent Year, at a noontime showing in an almost empty theater. In the restroom, after the show, there I was discussing the film with a movie-goer who'd been sitting a few rows ahead. Moral ambiguity & liquid soap made interesting partners. It's a great film, and for city dwellers, a location-spotting dream. My favorite spot? Hard to choose, but maybe the New Utrecht subway station, which appears in the movie at a moment of high dramatic tension. This one's definitely up there in my subway station pantheon - an above-ground vision of romantic dereliction! The new-look Fourth Avenue storefronts. 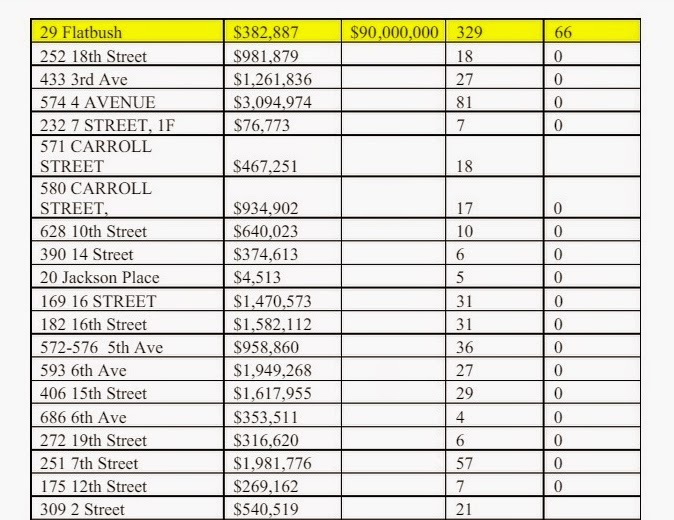 According to the MTA, the stores will be ready for occupancy by 2016. Sold in January for $1,200,000. No approval as yet for proposed four-family. 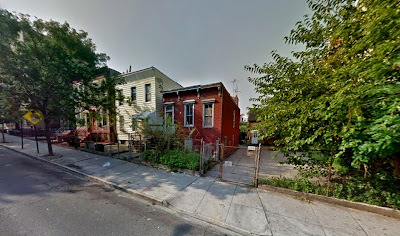 As if to cause confusion here, there are also plans afoot for demo & new four family at 197 23rd Street, which sold in December for $850,000. Fifth ar 40th. There are four shuttered stores on this side of the block. 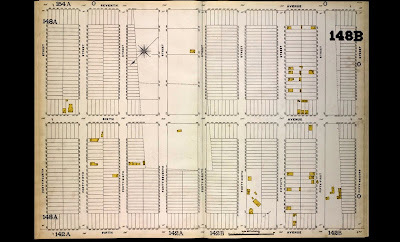 down to 6th, & the Flushing Meats truck, idling at the curb by Gonzalez grocery store, and down, down, best of all, the steep dip down to Fifth on Sunset Terrace, harbor in sight. And home along the avenue. 50th Street - Fifth/Sixth. 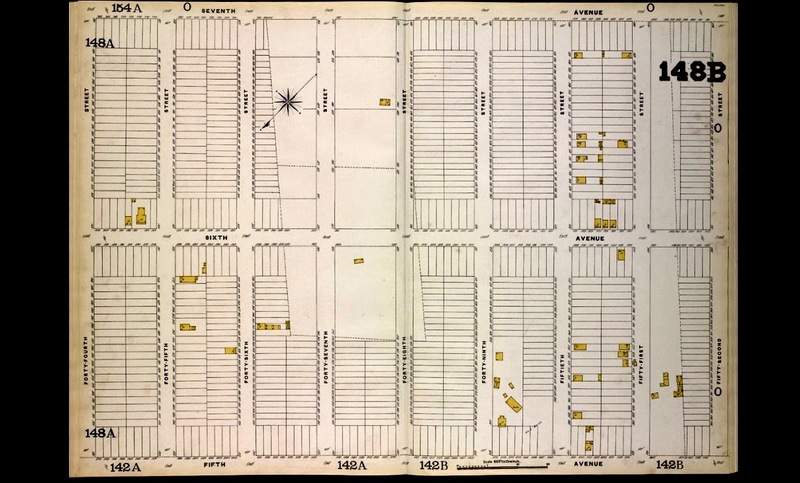 A look at a Sanborn Insurance Map shows how sparsely developed this part of Sunset Park was in 1888, with lots in the street grids largely empty, and not completely subdivided. I think this is one of the houses on the map, though I might be wrong. It's on a double lot today, with another small house set farther back, and some kind of building behind it. Worn down by time, but still a thing of beauty. I took altogether too many pictures of this Pontiac Grand Prix, parked on 15th by Santini's and the fire-damaged 243. With this car, and this block, every angle's a winner. On the Real Affordabilty for All campaign to end the 421-a tax break program for (mostly luxury) apartment construction. 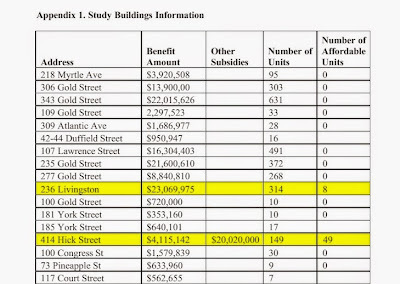 While the majority of the housing constructed using 421-a is located in Manhattan, in 2014, Real Affordability for All conducted a study of 61 Brooklyn buildings that received 421-a subsidies. 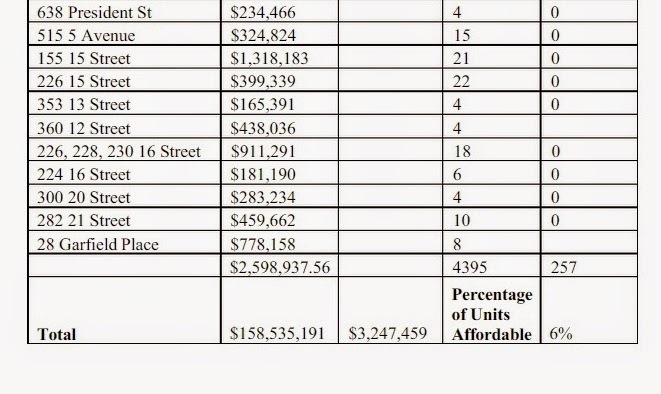 The study found that only 6 percent of the 4,395 apartments in them rented for below market rate; only five of those 61 buildings, constructed in downtown Brooklyn, Prospect Heights, and Park Slope from 2008 to 2012, contained any below-market-rate units. Of the 257 “affordable” apartments, only 31 were cheap enough for a family making less than $41,000 a year—roughly the median income for city renters last year, according to a Census Bureau survey. 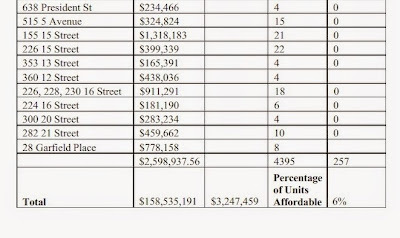 Virtually all those below-market units received substantial public subsidies in addition to 421-a, such as federal low-income housing tax credits and the city’s Inclusionary Housing Program, which lets developers build more apartments than zoning would normally allow if they include some below-market ones. 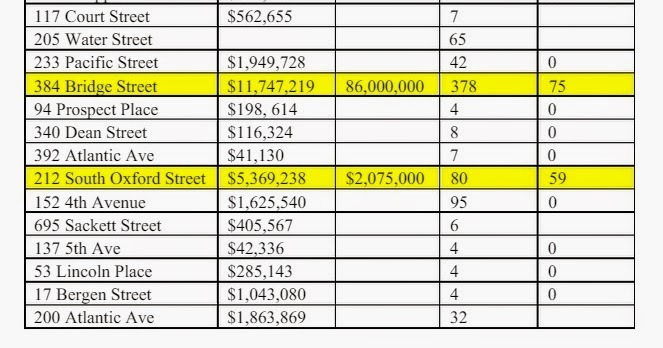 One building with 303 market-rate apartments and 75 “affordable” ones got $11.7 million in 421-a benefits and $86 million from other programs. 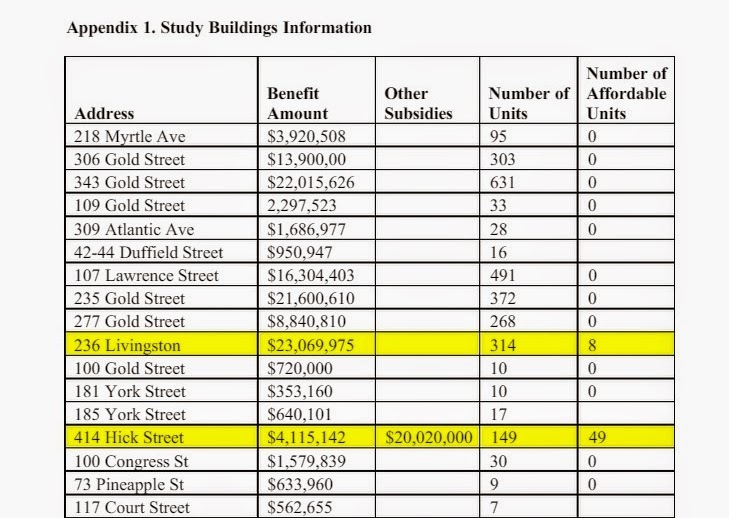 The single building that received no other public subsidies got $23 million from 421-a, for 306 luxury apartments and eight affordable ones. 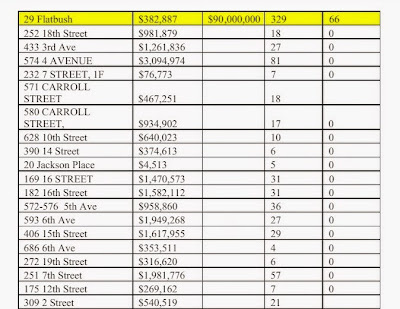 The study estimated that each below-market apartment produced cost $642,000 in public funds. 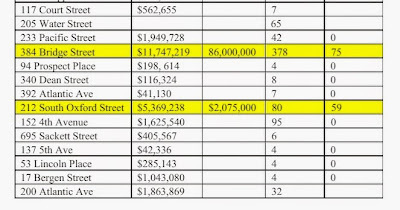 Here's a table that lists the apartment buildings in the study, the tax benefits & other subsidies received, & the number of units built. You'll recognize plenty of buildings here.